Pusan (also written Busan) Air Base is located on the southeastern tip of the Korean peninsula. The air base is located in the Suyong River Valley, 8 miles (15 km) northeast of the city of Pusan. 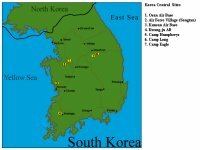 During the Korean War, Pusan Air Base served as a hub for 2 associated facilities used as bases for USAF and USMC aircraft. 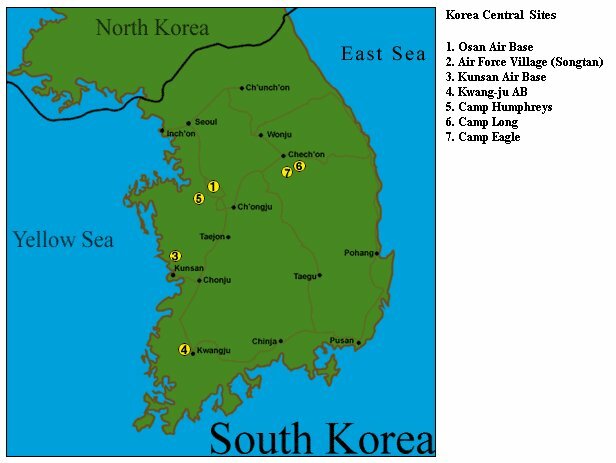 These were Pusan West (K-1) and Pusan East (K-9) Air Bases. Pusan Air Base subsequently became primarily a Republic of Korea Air Force facility. K-1 was also renamed Kimhae (Gimhae) Air Base. Pusan East Air Base (K-9) became Pusan Air Base. One of the Korean peninsula's major rivers, the Naktong-gang, runs north to south, 8 miles (15 km) west of the base. Hills and mountains cover about 75 percent of the Korean peninsula, with the remainder covered by scattered lowlands. Most of the rivers are short, swift, and shallow due to topography, narrowness, and sand deposits within the river. The extensive mountain ranges of the Korean peninsula influence the weather at Pusan Air Base considerably, by blocking and modifying cold polar air masses moving in from the northwest. The major range affecting Pusan weather is oriented north to south through south central part of the Korean peninsula, with peaks ranging from 4,000-6,000 feet (1,220-1,829 meters). A secondary range with peaks 2,000-4,000 feet (610-1,220 meters), extends southward from Taegu to Pusan. The large expanse of water to the south has a major influence on the weather also. Pusan lies at the foot of a basin known for producing strong drainage winds.